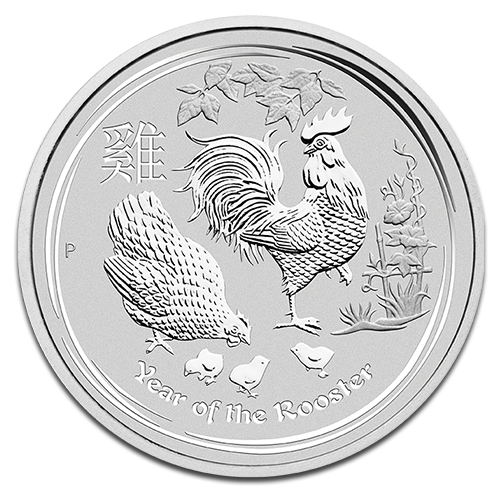 Another magnificent edition in the Perth Mint's Lunar II series, the 10 oz 2017 Year of the Rooster silver bullion coin will be available from 12th September at CoinInvest.com. This is one of the largest in the famous Chinese Zodiac inspired series, along with the 1 kilo coin, and it's a smart choice for new and established investors. Each coin contains a full ten ounces of fine silver. Outstanding purity of 999/1000 plus a unique design by Tom Vaughan makes this superb silver coin a must for serious collectors. It is also ideal for those looking for a safe haven for capital and these highly sought after coins are guaranteed to increase in value. You'll find the 10 oz Lunar II Rooster Silver 2017 at the best possible prices at CoinInvest.com. Our fully encrypted system assures your safety and privacy and all orders are shipped promptly.